I started by heading out across the Causeway, which is the little road between Nailsea, where I live, and Tickenham, which is the next village along. It’s called the Causeway because it winds its way across the low-lying moors – and floods readily when the winter rains come. The church you can see in the photo below, incidentally, is the church of St. Quiricus and St. Julietta. 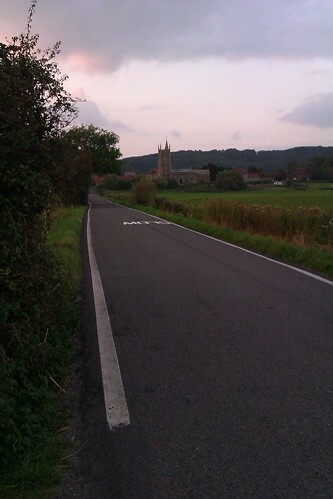 Once I’d got across to Tickenham, I was able to leave the tarmac road behind me and head uphill on the old farm tracks. It’s a fairly steep hill, but I run up it quite a lot (it’s my favourite place for hill training session) and enjoy the technical terrain underfoot. And the view from the top is well worth the effort of struggling up the contours. 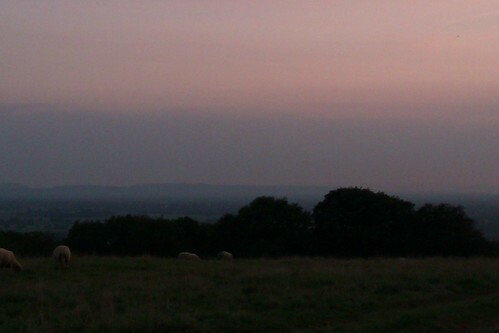 With the sun behind me, the hills across Somerset had turned a beautiful pinkish hue. 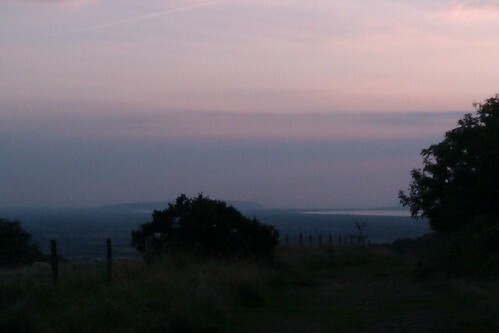 In the distance, I could see the last flickers of light reflecting off the waters of the Bristol channel. And behind me, the mountains of the Brecon Beacons in Wales were slowly disappearing into the evening mist. Standing there, completely alone and with the lights of houses and cars twinkling on one by one in the valley below, I felt truly like the King of the World. Even if only fleetingly, for a single moment. And it was with no small amount of regret that I turned around and headed downhill for home. This entry was posted in Running and tagged Photography, Running, Somerset by Simon Perks. Bookmark the permalink.